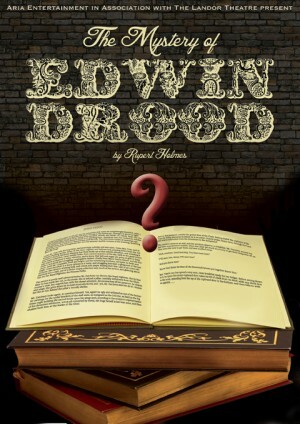 Aria Entertainment in association with The Landor Theatre present 'The Mystery of Edwin Drood'. A musical by Rupert Holmes, 'The Mystery of Edwin Drood' is the fifteenth novel by Charles Dickens. During October of 1869, at Gad's Hill Place, Dickens began work on the novel and in April of 1870 publication of Drood commenced. On June the eighth Dickens spent the day working on the novel and after a long and exhausting day he retired to seek some well deserved rest. That evening during dinner he collapsed. June the ninth, 1870 only halfway through 'The Mystery of Edwin Drood', Dickens died. And now members of the Theatre Royale Music Hall Company pick up where the unfortunate writer left off. Set against a back drop of the Great British traditions of music hall and pantomime they will attempt to complete the story of Edwin Drood for the delectation of you, the audience! Box office: 020 7737 7276. £18/£15 (concs).